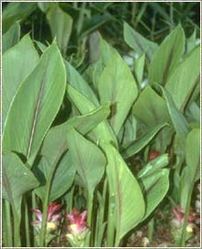 Common Name : Zedoary Root, White Turmeric. Habitat : Weed found all over india. Uses : Roots are pungent tasting, warming and slightly aromatic. Improves blood circulation, anticontusion and improves menstrual flow. It helps in abdominal cramps, amenorrhea-abdominal pain and rheumatic pain. It also helps in pain and swelling associated with sprains. The bitter tincture of zedoary root is used to prevent disease recurrence and to treat ulcers. Aromatic, stimulant, useful in flatulent colic and debility of the digestive organs. It is used in antiperiodic pills and zedoary bitter tincture. It is active in dyspepsia, colic, vomiting, cough and menstrual disorders. It is also used as a restorative.